Portugal against France or Ronaldo against Griezmann – this is how you could have called the final game in the European Championship. It was interesting before the game, especially the question how both teams would try to take the respective Stars out of the game. Unfortunately, that was at least taken too literally from one side. The Portuguese superstar had to leave the game too early. What were the consequences, you read in the analysis! France Has Good Approach On the Left Side! Since Ronaldo could not play long, we just focus on Griezmann. Portugal tried at least partly very man-oriented against the best scorer of the French. In itself not a problem to the more centrally lasting Griezmann, whose evasive movements were usually limited to running towards the ball. Example: France is in the buildup. Portugal defends (a little bit too) man-oriented. Griezmann is just as closely defended as Payet. Griezmann doesn’t explore the space between Pepe and Cedric. Larger problems had the Portuguese, however, from another man-orientation. Payet was defended on the left wing, before even getting the pass, very closely by Cedric. The result was a larger space between Cedric and Pepe. Unfortunately, (for the French) Giroud used this space every now and then and got the ball with a view to the outside line, usually outside the box. Example: Giroud uses the distance between Cedric and Pepe. No problem for Portugal, because even if Giroud puts a ball into the center, who is expected to be the target man?! That could have been used much better by France. Payet remains outside, Giroud remains inside. Griezmann uses the open space. This has several advantages. Griezmann is a pretty bad match-up for Pepe, who would have to defend more outside. This would leave Fonte in a 1v1 situation against Giroud, who now is the target man in the box. 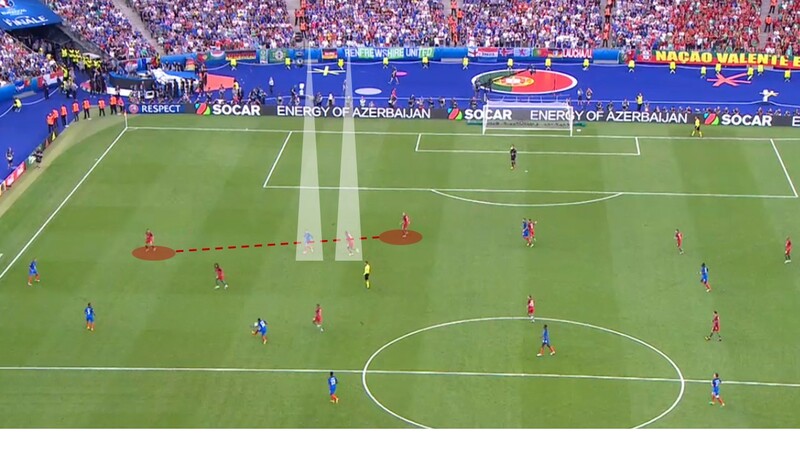 Example: The ball is with Payet on the wing. but Griezmann remains central, with a run at the open space he could easily loose his direct opponent. His pace and left foot would give a great opportunity to play the ball in the box to Giroud. 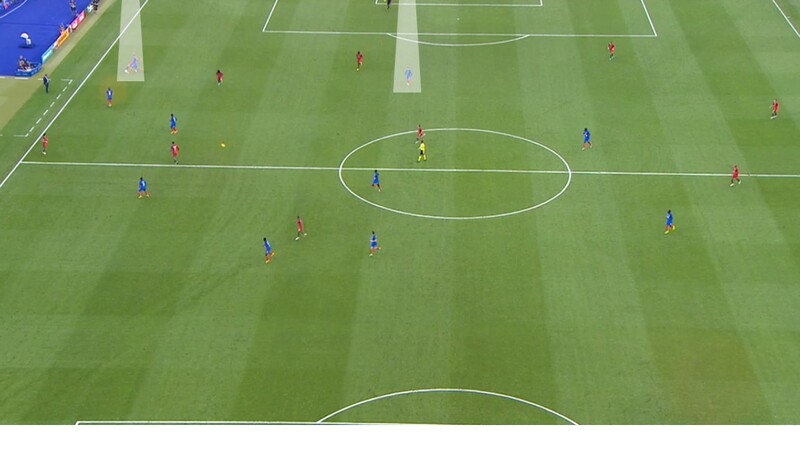 The alternative for Portugal would be to position Cedric significantly more inward in order to prevent this pass. 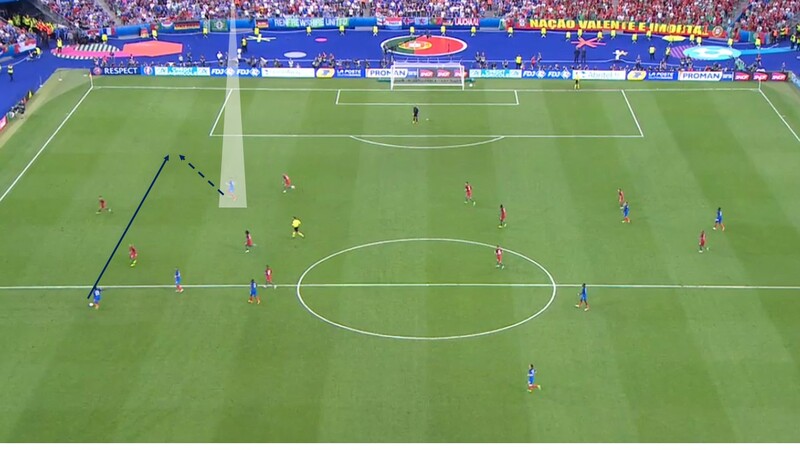 That would, however, open more space for Payet… From the perspective of France they did not take advantage of this problem in Portugal’s defense. Note: To detect and to capitalize on open spaces in the opponent’s organization, is one of the core characteristics of good players and coaches. Note: This way of defending makes you also extremely vulnerable for counterpressing, as seen in a few scenes in the first half. France on the other side had a ball winning strategy in place. Example: Giroud puts pressure on the outside. The site is closed for Portugal. 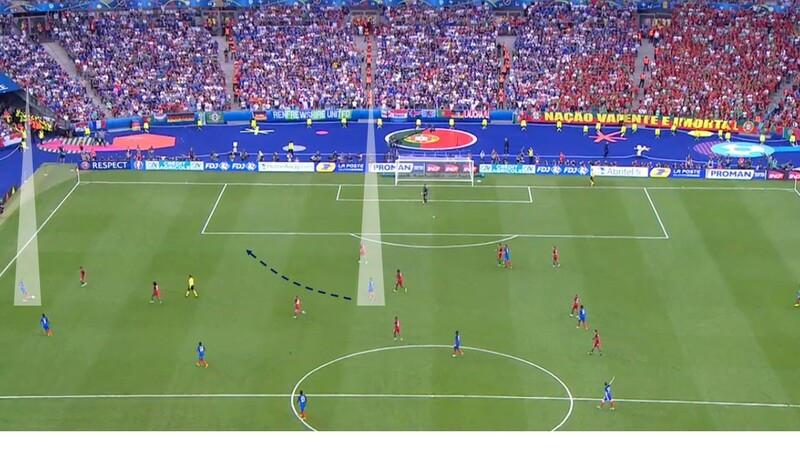 If the ball is won (which happened) Griezmann is the target man in the central attack (which happened). 2nd Half – France Makes It Hard On Themselves! We remain with this analysis on the French left side. 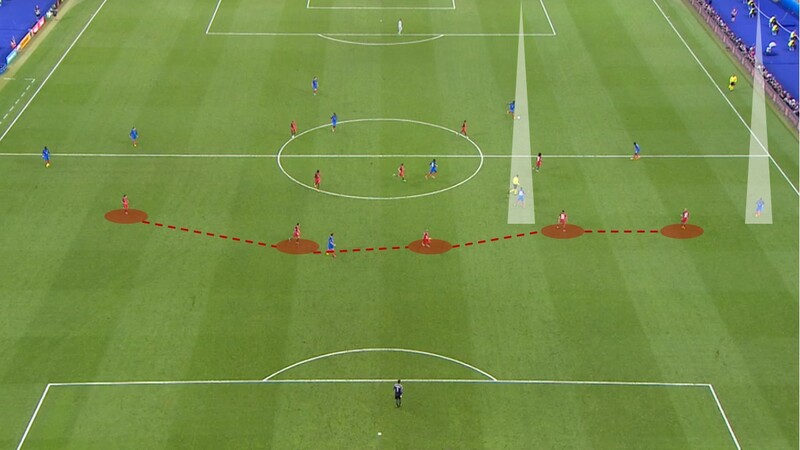 Because one can demonstrate some more fundamental mechanisms in football. Over the second half, the left-back Evra positioned himself in a much higher position. Basically, of course, a good idea. This way Payet / Coman could run into the center and Evra occupied the wings. The only problem is that a low-block opponent simply runs backwards. This led to a situational five back formation of the Portuguese and the former advantage for France, that is explained in the first part was gone. Example: Evra runs at the wing position. Portugal reacts and plays with five players in the back – even more difficult to score. Note: This is actually a good example of how a coach can naturally change the style of play with one substitution. Unfortunately, Coman also preferred more interaction with Griezmann or Giroud / Gignac. 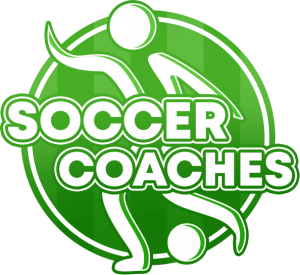 Due to coach default or natural player behavior, we will probably never know. 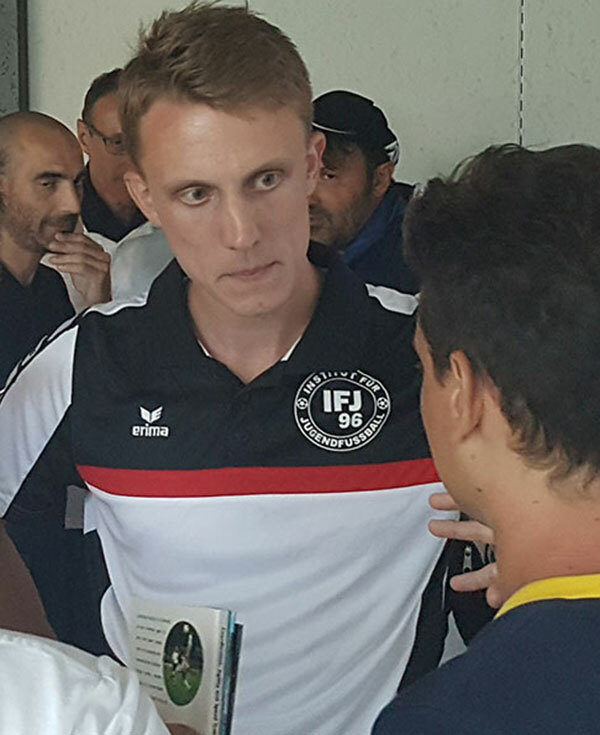 This combination of Frances lack of offensive strategy und Portugal’s lack of counterattacking strategy lead ultimately to a game time higher than 90 minutes. Final Thoughts: Why Pogba was not positioned higher and was more likely to find the interaction with Griezmann is, will probably be a mystery for ever. That Portugal ultimately scored in the addition time one could only speculate: Perhaps the 3 day break were in contrast to the French (2 days) a small advantage.